All colleges promise a good education. Very few promise not only to educate but to elevate the whole person. Hellenic College is that rare institution of higher learning with a higher purpose: to foster the moral and spiritual as well as intellectual development of every student. It offers opportunities unmatched by any other college or university for this multidimensional development in the context of a truly Orthodox Christian community. Hellenic College’s curricula in the liberal arts and pre-professional studies stimulate students’ minds while preparing them for careers in which they can serve both society and the Church. 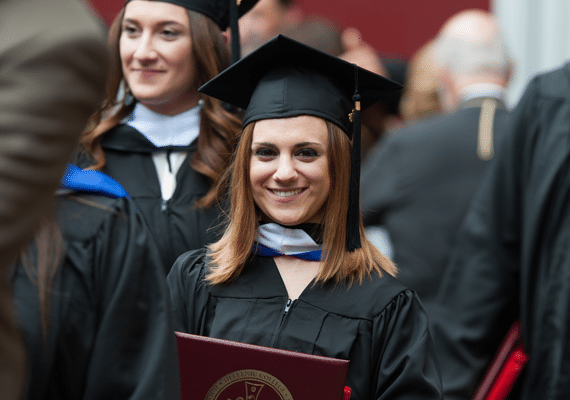 Whether in education, human services, business, law, or ministry, our graduates embody their faith and enrich our world through their other-directed vocations. the Fathers, Church history, ethics, and every other aspect of our ancient faith. Their daily lives are centered on and immeasurably enriched by worshiping with the entire HCHC family in Holy Cross Chapel, the heart of our campus. They grow individually and together, intellectually and spiritually, always mindful that the superior education they receive at Holy Cross is not an end in itself but just the beginning of life as Christ commands it to be lived: with faith, with purpose, and with love for all mankind. The mission of Hellenic College, Inc., is the formation and the education of the person within the life of an Orthodox Christian community. To that end, it educates men preparing for the holy priesthood of the Greek Orthodox Archdiocese and other Orthodox Christian entities, as well as men and women for leadership roles in the Church, chosen professions, and society. 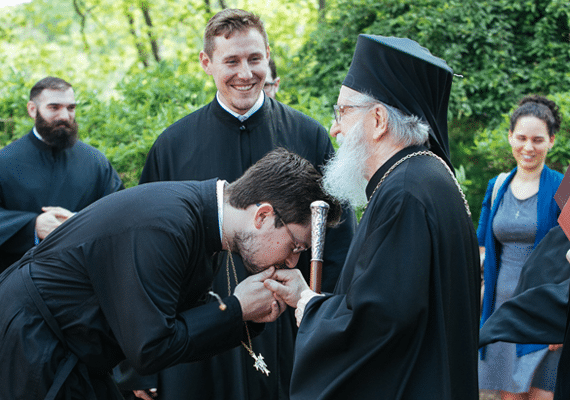 Hellenic College, Inc., collaborates with Orthodox Church‐affiliated institutions and ministries, and offers opportunities for lifelong learning. The institution was founded in 1937 in Pomfret, Connecticut, by Archbishop (later Ecumenical Patriarch) Athenagoras and Bishop (later Archbishop) Athenagoras Cavadas, who served as the first Dean. Known first as The Greek Archdiocese Institute, the seminary soon became known as Holy Cross, the name it carries to this day. The program of study expanded from two years to five in 1939. The first class graduated in 1942. In 1947 the school moved to its present location in Brookline, Massachusetts, just outside Boston, so that students and faculty could take advantage of the abundant educational and cultural opportunities in the “Athens of America.” Over the next twenty years, the five-year program expanded further, first to six years and then to seven, to include a collegiate/pre-theology course of study. As the first step to achieving full accreditation, the school incorporated in 1968 as Hellenic College, Inc., with a four-year undergraduate school, Hellenic College, and a graduate school of theology, Holy Cross Greek Orthodox School of Theology. Hellenic College received its first accreditation in 1970, with full ten-year accreditation for the entire institution granted in 1978. 1971 saw the first graduation of a female student from Hellenic College. The first female to graduate from Holy Cross did so in 1976. When Holy Cross was founded, all of the students were young Greek or Greek-American men preparing for the priesthood. Today both schools welcome men and women from all over the world who wish to pursue their education in an Orthodox Christian environment. 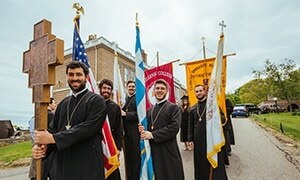 Hellenic College Holy Cross is the only fully accredited Orthodox Christian college, seminary, and graduate school of theology in the Western Hemisphere. The Orthodox Church, also referred to as the Eastern Orthodox Church, is the One, Holy, Catholic, and Apostolic Church established by Jesus Christ in The Great Commission. The Orthodox Christian Faith, its traditions, and its ordained clergy can be traced in direct, unbroken succession from the Apostles. Orthodox Christians believe in and worship the Holy Trinity – Father, Son, and Holy Spirit. They confess Jesus Christ as the Son of God, born, crucified, dead, and risen, as professed in The Nicene Creed, our Symbol of Faith. He is the Messiah, the perfect and complete fulfillment of Old Testament scripture and prophecy, the One who has come and is coming again in glory. To learn more about the Orthodox Christian Faith and to purchase books and religious items, please visit Holy Cross Bookstore. Please visit Holy Cross Chapel for an updated schedule of worship services. We would love to welcome you! All press and event inquiries should be directed to the HCHC Office of the President. Please contact us to make a request. Use of the Hellenic College Holy Cross name, logo, and/or official seal in third party promotional materials, whether printed or electronic, requires written permission from the HCHC Office of Marketing and Communications and is subject to review prior to publication. Please contact us to obtain permission. Images owned by Hellenic College Holy Cross may not be used by third parties without first obtaining permission from the HCHC Office of Marketing and Communications. This policy extends to images displayed on the HCHC website and the school’s official social media channels. Please contact us to request high-resolution images for use in third party print publications or website-quality images for use on social media channels or websites that are not directly affiliated with HCHC.